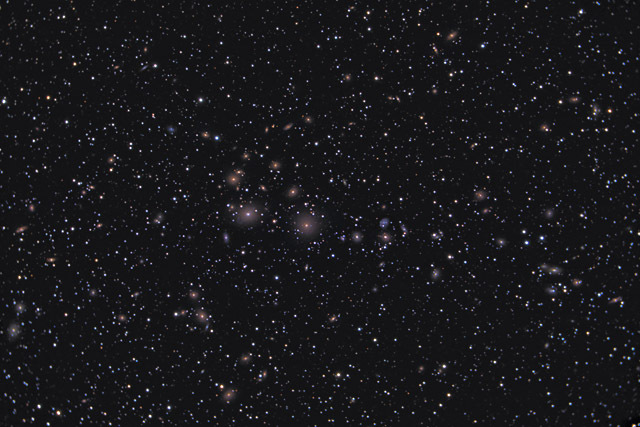 This image shows the Perseus Galaxy Cluster, also known as Abell 426. The cluster of galaxies contains over a thousand galaxies. While processing this image, I counted 103 objects which are clearly galaxies and saw almost as many small faint, fuzzy objects which appear to be galaxies as well. Given that an average galaxy contains between 100 billion and a trillion stars, this image probably displays in the ballpark of 100 trillion stars! 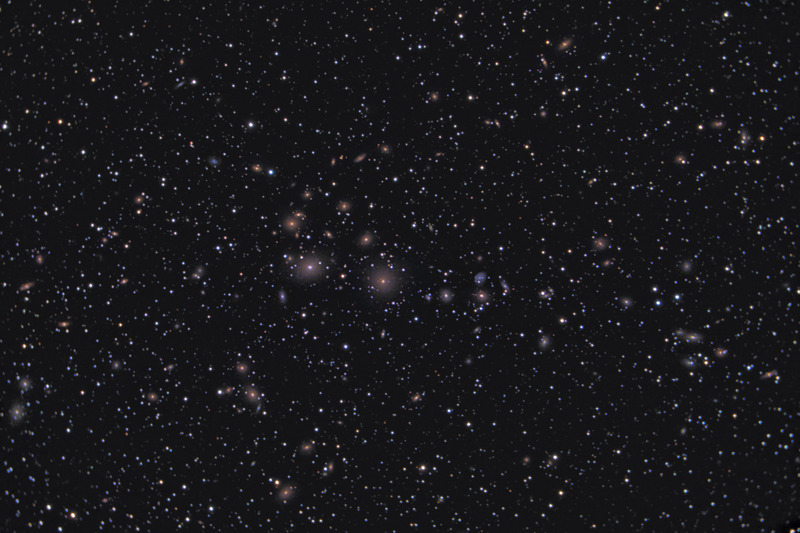 The brightest member in the cluster is NGC 1275 - a giant elliptical galaxy just left of center in this photo. NGC 1275 is one of the brightest X-Ray and Radio wave sources in the sky. To the right of NGC 1275 is another giant elliptical galaxy, NGC 1272. There are numerous other NGC galaxies in this image. Be sure to click on the photo to see the enlarged view, and see how many galaxies you can count! In this image, North is Up. This image is cropped to 95% of the original full frame. Software Used Images Plus 4.0 for camera control, calibration, stacking and digital development. Photoshop CS5 used for flat fielding, curves, color correction, saturation adjustments, star shrinking, noise reduction, and high pass filter. HLVG for additional color correction, Carboni Actions for additional saturation adjustments. Notes This image was a lot of fun to process, as trying to bring out the faint galaxies and the color proved to be very tricky. This cluster represents the largest number of stars I have photographed at one time. Although I had wanted to expose this object for more time (weather didn't cooperate), I'm quite happy with the final result. This image was chosen Digital Astro Challenge Photo 2nd place for November 2011 in the Galaxy Category.